Largest global corporate that includes Indian tycoons are expected to exhibit huge appetite for M&A transactions in the year 2014 compare to last year, as per the KPMG International latest Global M&A Predictor. Isn’t it encouraging?In addition to boosting confidence, global analysts are also predicting corporates to manifest improved potential to undertake transactions in this year than last year. The Indian M&A activity has begun to witness more traction and improved interest in the later quarter and expect it to continue at the end of 2014 also, making it a much better year. Flipkart, India’s biggest online apparel retailer, is going to own competitor Myntra.com, to gain a business with greater margins and to stimulate competitiveness against Amazon.com Inc.
Myntra, India’s biggest apparel e-store, valued about $330 million, and its shareholders will receive a cash payouts and stakes in Flipkart, as per reliable resources. A formal announcement is expected within a week as per the resources. 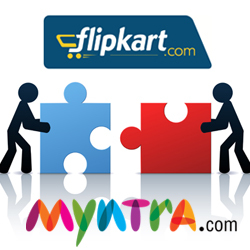 Acquisition of Myntra will provide Flipkart with added customers and help challenge Amazon, which has also become a tycoon by acquiring several rivals, which also includes the $1.2 billion deal of shoe retailer Zappos.com in 2009. Yet another example of improved appetite of Indian Merger and Acquisition is the deal that has been struck between Vodafone’s South African Associate Vodacom and Neotel, managed by Tata Communications. As per this deal Vodacom will take over Neotel at a whopping 7 billion rand (nearly $676 million) price. It has been announced mutually by the shareholders of both the companies that they have reached an agreement on the commercial architecture and terms and conditions to proceed for this M&A to acquire 100% of the shares of Neotel, which worth ZAR 7.0 billion, nearly Rs 3,950 crores! In the same line Asian Paints Limited will acquire Ess Ess Bathroom Products Private Limited’s front-end business! Albeit, the acquisition would be driven by satisfaction of certain conditions and other applied statutory approvals, the merger and acquisition has started to gain momentum in Indian market with an aim to maintain the capital flow. The year 2013 had witnessed the bottom out of M&A activity in India. The domestic economy was moving at a snail pace, with high interest rate environment, lack of any development on much required financial policy reforms and a volatile Indian rupee led to a depressed M&A sentiment. Indian investors have been patient and reluctant in the last few years, but with the sharp increase in deal capacity and given the global markets stability in certain aspects, the pressure on cash-rich corporates to begin making deal has shot to new popularity graph. The Indian economy has been manifesting new signs of reaching the lowest levels in terms of growth in the year 2013 but with catapulting stability in the global marketplace it will drive up M&A sentiments and add value to its mainstream economy.